LECIP is an electrical equipment manufacturer active in the following business areas, based on the three pillars of lighting, electrical power conversion, and information processing. LECIP's forte has always been development of products able to withstand adverse usage environments (e.g., outdoors, vehicular environments). 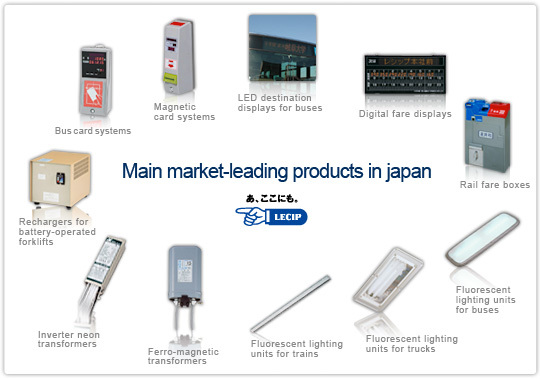 LECIP has been pursuing a strategy of capturing dominant market shares by utilizing the technologies and know-how it has amassed over its long history to deeply penetrate selected markets, even small niches, with products such as industrial equipment, power supplies for outdoor advertising installations, and equipment for single-manned buses and trains. Armed with the flexibility to meet both the needs of the times and customers' highly specific requirements, LECIP has assembled a broad array of products, many of which have captured the top share of their respective markets. This is a key source of LECIP's strength. Additionally, LECIP has a long track record of painstakingly customizing products to individual customers' respective specifications. We have applied these customization capabilities to new product development also. Such capabilities form the nucleus of LECIP's ability to develop innovative, market-dominant products ahead of the competition. Looking ahead, we will continue to pursue growth by developing new core products for selected markets in the LECIP tradition. We intend to refocus once again on our business philosophy of contributing to the realization of a "comfortable everyday" by providing customers with what they truly need. LECIP is known for producing numerous products with top market shares, through the use of flexible adaptation and specialization for niche markets. LECIP consistently develops new applications that harness recent and latest technology. While many bus routes today use bus card systems that enable riders to pay their fares with prepaid cards, it was LECIP that originally pioneered this system in Japan back in 1988. In 1999, LECIP became the first company in Japan to adapt non-contact IC card technology to bus card systems (for use on routes with several fare zones). By realizing a non-contact IC card system for buses that is quick and multi-functional, we have created new markets. LECIP has produced several other products that have been national and industry firsts, including digital fare displays, and the microcomputer-based battery recharger for forklifts.